The stinging emotional truth and raw grit of a movie like Lance Hammer’s Ballast, is a little like a spare organic feast in a sea of contrived, cookie cutter, junk food Hollywood merchandised fare. And it’s that jolting revelation and spark of recognition as Ballast unfolds, a sobering, heightened awareness that takes hold of just how far big bucks productions have moved away from real lives, our lives. The narrative details of Ballast are stark in their simplicity. But captivating to behold, as the wounded lives of these characters flow into ours with all the natural spontaneity of strangers we come to know by delicate degrees. And to care about enormously while barely realizing it, instead of the usual contrived situations on screen ostentatiously shoved in our faces. 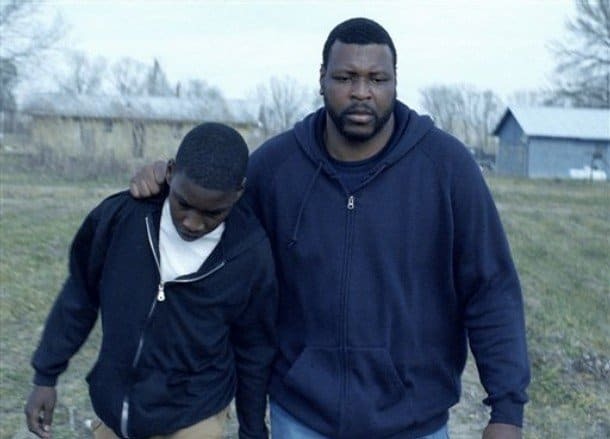 As Ballast begins one stark, dreary winter somewhere in the rural Mississippi Delta, a concerned neighbor knocks on the door of Lawrence (Michael J. Smith), a barely lucid, sullen and withdrawn black man whose brother Darius lies long dead and rotting in the next room, after committing suicide. As the scattered pieces of this family configuration begin to come together, we learn that Darius had once been romantically involved with Marlee (Tara Riggs), an overwhelmed struggling African American single mother who lives down the road in a trailer and barely makes ends meet cleaning toilets for a living. Her troubled twelve year old son James (JimMyron Ross), whose estranged father is the late Darius, is a confused and angry young boy who has become involved in a downward and dangerous spiral of drugs and theft. As the relationships among these three characters are sorely tried around the death of Darius, how all of them will continue to just barely survive against the odds of an array of cruel emotional and financial ordeals that present themselves, is at the heart of this somber masterpiece in the real deal tradition of acclaimed African American filmmaker Charles Burnett. And that writer/director Lance Hammer, who is white, created this vividly authentic drama by seeking out nonactors in the Delta and just letting them be themselves and speak their own words rather than imposing an outsider perspective, makes for a bracing and astonishing cinematic experience. And whose only fault is perhaps the rather abrupt finale which cuts off the truly precisely portioned out slice of life narrative in mid-flight, leaving viewers craving much more.